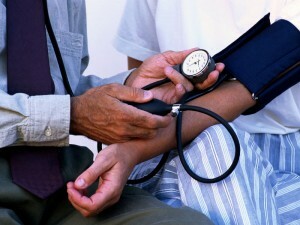 A sphygmometer is a blood pressure meter also referred to as a sphygmomanometer . The equipment is used to measure blood pressure and comprises an inflatable cuff to restrict blood flow, and a mercury or mechanical manometer to measure the pressure, together with a mechanism for inflation which may be a manually operated bulb and valve or a pump operated electrically. In order to gain a BP reading the sphygmometer is always used in conjunction with a means to determine at what pressure blood flow is just starting, and then at what pressure it is unimpeded. Electronic versions do these readings automatically whereas manual sphygmomanometers are used in conjunction with a stethoscope.